In light of recent events in Charlottesville, Virginia and other cities across the nation, a panel discussion on Civil War Monuments has been planned in Cooper Union’s renowned Great Hall, on the subject of their meaning, the complex histories that surround their realization, and the current socio-political conditions that are causing their very existence to be reconsidered. Should these monuments be saved? Should they be torn down? Is it possible—or even appropriate—to make thoughtful, informed interventions into these works of public art that can preserve their history, diffuse the myth and polarization that surround them and serve as teaching moments for future generations? These and other questions will be posed during the program. 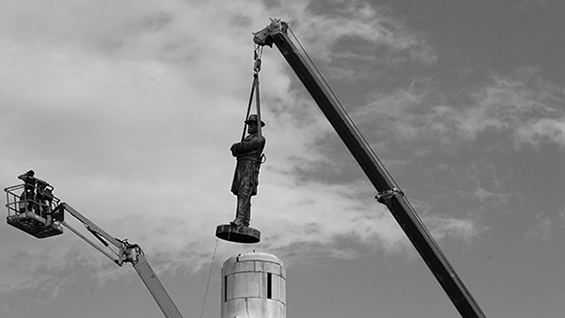 Mya Dosch, faculty member of The Cooper Union’s Humanities and Social Sciences who is teaching the fall 2017 course “Take ‘em down: Monuments, Artist Interventions, and the Struggle for Memory in the Americas,” will moderate. The event is free and open to the public. General public should reserve a space here. Please note first come, first seated; an RSVP does not guarantee admission as we generally overbook to ensure a full house. All registered seats are released 15 to 30 minutes before start time, so we recommend that you arrive early.